SINGAPORE, Oct 20: The women’s tennis season concludes at the WTA Finals in Singapore next week and, like a majority of tournaments during the 2018 campaign, picking a winner from a wide-open field seems a near impossible task. With Serena Williams battling to regain fitness and top form following a difficult childbirth in 2017, the Grand Slams went to four different women for the second consecutive year. 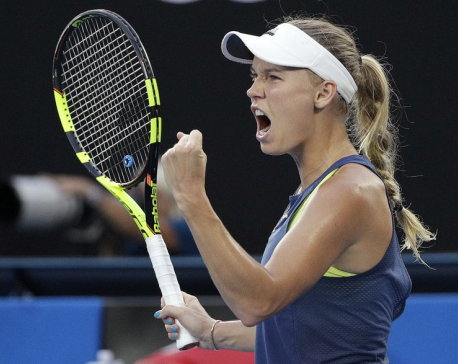 Caroline Wozniacki was one of three first-time major champions when she captured the Australian Open in January and the Dane is back in Singapore to defend her WTA Finals title full of confidence and momentum. The other maiden major winners were French Open champion Simona Halep and rising Japanese prospect Naomi Osaka, who stunned Williams in last month’s controversial U.S. Open final, while Angelique Kerber beat Williams at Wimbledon to claim her third Grand Slam title. Halep is the only one of the four Grand Slam champions to miss the WTA Finals after a back injury forced the world number one to withdraw just days before the event. Williams, who played in only seven events this year, three of them Grand Slams, has not been to the season finale since winning it in 2014, when it was first staged in Singapore. The eight women who earned a spot at the tournament have been divided into two pools of four, with play getting underway on Sunday in the White Group when big-hitting Czech Petra Kvitova takes on Ukraine’s Elina Svitolina. World number two Wozniacki will open her campaign immediately after that clash in the other White Group match of the night against Czech Karolina Pliskova, a player she beat in last year’s semi-finals on her way to the title. “All the best players are here so there’s no easy matches. I’m just excited to start the competition and do my best,” Wozniacki said at Friday’s draw ceremony. Kerber and Osaka are the top seeds in the Red Group with the German opening her campaign on Monday against Halep’s replacement Kiki Bertens after Osaka takes on American Sloane Stephens, her predecessor as U.S. Open champion. Last year, Wozniacki rode the momentum of a late season surge all the way to victory at the Singapore Indoor Stadium and after the 28-year-old won her second China Open title earlier this month, she will be hoping for a similar outcome this time. While half of the field have stuttered slightly after strong starts to the season, Osaka and Pliskova also have some momentum heading into the eight-day event, the Czech having beaten the Japanese at the recent Pan Pacific Open final in Tokyo. Osaka admitted she was mentally exhausted in that final following her draining triumph in New York and the fan favourite, who turned 21 just days ago, could confirm her arrival as a major force on the women’s tour. Pool play concludes on Friday, with the semi-finals and final taking place next weekend in the fifth and final running of the event in Singapore before it heads to Shenzhen in China for a 10-year run from 2019.